Man, I am just eating up all the hype this week. Two of my favorite television events are getting awfully close - The Super Bowl and the return of Lost. We've had NFL Network on pretty much non stop since the Patriots clinched another SB appearance and I am sooo psyched for Sunday to get here. The only thing making me relish the days before Sunday is the return of my favorite TV show - Lost. Tonight the two hour finale from last season (I'm still in awe of that ending, Jack screaming he has to go back to the island - AWESOME) is being re-shown on ABC and tomorrow night Season 4 finally kicks off. I know the writer's strike is making this a short season of only 8 episodes, but I'm salivating for those 8 shows. A little Lost is better than no Lost. Time will tell which show is more exciting. The season premiere of Lost with its flashbacks and flash-forwards. Or Super Bowl 42 with the Patriots being the first team EVER to go 19 and 0 in a season and continue the New England dynasty. Lori and I went to see "Cloverfield" today - the movie with the cryptic ad campaign about something attacking New York City and ripping the head off the Statue of Liberty. First I must comment on how great an image that is - a spin on the classic last scene from the original "Planet of The Apes", with the arm and torch of the statue sticking out from the ground. 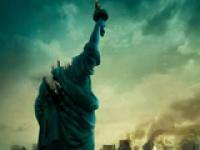 The "Cloverfield" poster is a shot of a headless Statue of Liberty standing before a smoldering Manhattan. As we were walking into the movie, I wondered out loud what the title might end up meaning - you'll learn in the first seconds of the film that 'cloverfield' is the Dept of Defense code word for the whole mess that goes down in NYC. This movie is from some of the people behind "Lost" (my favorite TV show) so I've been waiting to see this since I first saw the trailer months ago. The previews were all camcorder footage of a party that is interrupted by some sort of attack. Well guess what - that is the whole movie. This is definitely a love-it or hate-it flick, and I am firmly in the loved-it camp. It is "Godzilla" meets "Blair Witch Project" with a heavy dose of 9/11 imagery sprinkled in. Actually, this is how I hoped the Godzilla remake a few years ago went - traditional story told from new angle/style. The whole movie is 'found footage' like Blair Witch was. You don't know any more than the characters making the video know. And just like when I first saw Blair Witch nine years ago (wow, its been that long? ), when this movie ended, half the audience walked out complaining about it. Lori and I loved the whole ride. There are disturbing images, many scares, suspense and a nice ambiguous ending - many people hates those, but I like knowing the story continues beyond what I see on the screen. This is really just an old fashioned 1950's monster movie (a la Creature Double Feature for those who grew up in the Boston area) where a creature shows up and starts reeking havoc. One bit of advice, if handheld camera work bothers you - stay away. This is one shaky, hard-to-follow ride - but for me, that was half the fun. Trying to decide just exactly what you're seeing really pulled me into the movie. But have no fear, before it's over you will see the monster... up close and personal. Wow, what a weekend for football! First Green Bay destroys Seattle in an action packed snow game at Lambeau Field. The snowy images brought back warm (freezing cold actually) memories of our own Snow Bowl back in 2001 playoffs that started this whole Patriots Dynasty. We watched the Green Bay game from Gillette Stadium while waiting for the Perfect Patriots to take on the Jacksonville Jaguars in the Pat's first playoff game of this season. Give the Jags their due, they showed up to play and they played hard. They didn't just come in running the ball as expected and they shut down Randy Moss, holding him to one catch. Watching the game live, it didn't feel like Brady and the offense were performing as well as the stats say they were. Tom Brady truly was perfect for most of the game, going 26-of-28 for 262 yards and three touchdowns. His 92.9 completion percentage was yet another NFL record. With long drives by both teams in the first half, the game went fast and was tied at 14. But even when the opponent brings their best game - the Patriots get even better when the game matters most. Our defense made great adjustments and shut the Jags down in the second half, holding them to two field goals. The highlight of the game for me was the best fake I've ever seen. The NFL needs to have an acting award because Tom Brady sold a fake handoff to Kevin Faulk so amazingly; both teams and the whole stadium seemed stunned when Tom still had the ball and threw for a touchdown. And give the fans some credit too - Gillette was LOUD, and it isn't always. Something about a dynasty can lull you into just sitting back and watching more than raising hell like fans should. The weekend just got better though, with San Diego shocking Peyton Manning and the defending champion Colts on Sunday. Even if San Diego wasn't now riddled with injuries, I'd think the Pats path to the Super Bowl just got a little easier. I was also pulling for the Giants to beat the Cowboys since those New York Football Giants played so well against the Patriots in the final game of the regular season. I really wanted to see teams the played hard to end the full season beat the teams that rested and coasted at the end. I love that Eli is going to the NFC Championship while his big whiny brother sits back home.